Make your paracord projects Reflect your awesomeness! Check out all of our colors of 550 paracord with Reflective Tracers all at once! 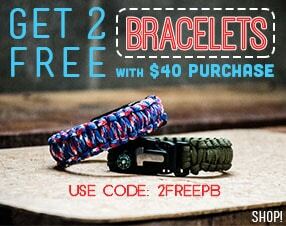 With prices starting at $3.99 + free same day shipping - Paracord Planet is the best paracord shop to buy paracord from. All colors of our quality 100% Made in the USA Paracord comes in 10 foot, 25 foot, 50 foot and 100 foot hanks, or buy in bulk with our 250 foot and 1000 foot spool options. Reflective Tracers create visibility that is great for projects that will be used at night! What is Paracord? Paracord (also known as Parachute Cord) is a lightweight, nylon kernmantle (inner core protected by a woven outer sheath) rope originally used in the military for suspension lines in parachutes as well as many other purposes where cordage was needed. Veteran’s found thousands of other uses for paracord as time went on including fishing line, survival gear, shoe laces, belts and so much more. 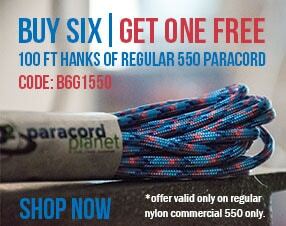 550 Para cord is one of the toughest, most dependable cords available. Beyond its 550-pound tensile strength and proven durability, the added qualities of being mold, mildew, rot and UV fade resistant makes it a top of the line rope. The smooth texture of the rope comes from the 32-strand interwoven nylon sheath (kernmantle). Encased in the strong and smooth sheath are 7 nylon inner strands, both of which contribute to the cords 550-pound tensile strength. Another bonus of paracord are the versatile inner strands – which can be removed anytime a smaller yet tough string is needed in any variety of situations such as fishing line, sutures, snares and accents just to name a few. Expanding the usage of paracord even further, easily learn weaves, wraps and knots tailor made for easy unravelling in survival situations. In addition to all the utility functions paracord serves, another widespread use for paracord is crafting. Make bracelets, handle wraps, belts, lanyards, whips and hundreds of decorative items. Delivered as expected. Have not yet put under load. Reflective quality is minimal, about as expected. Excellent quality product, bought this product to put on Boy Scout tents to provide extra viability at night. The reflective properties of this product and the quality of the materials should last for many a camp out! I've see reflective paracord before, but it always seems to frey where the reflective strands are and they pull out. Not with this! It is solid and holds up to the expectations of paracord. I’m currently just doing small things like building lanyards, dog collars and leashes. It has worked great! The only fault I’ve seen in any of it was one of my 25ft pieces had a snag in a part of the rope so I had to cut that pierce out. So I wasted about 10 ft.